On 10th March Maha Shivaratri was celebrated all over India. On Shivaratri day devotees visited Shiva temple and perform Shiva Abhishekam with milk and water. The holy items like Bilva leaves, Bel fruit, Dhatura and white flowers of Aak, which pleases Lord Shiva, were offered to Shiva Linga on the auspicious day of Shivaratri. Most Shiva devotees kept one day fast on Shivaratri as it is considered the most significant day dedicated to Lord Shiva. 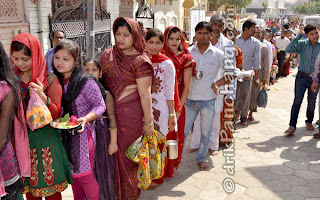 Since early morning there was huge crowd in most Shiva temples. There were long serpentine queues of devotees waiting for their turn to perform Shiva Abhishekam. In small towns, devotional songs of Lord Shiva were played throughout the day on loud speakers. At many places including Shri Krishna temple at Janmabhoomi, Shiva Barat was organized through street procession as Maha Shivaratri is also believed to be the marriage anniversary of Lord Shiva. Many ladies, who recently delivered a baby boy or got married, visited Shiva temple on Maha Shivaratri day as a gesture of thanksgiving to Lord Shiva. This ritual of thanksgiving is famously known as Jehar (जेहर) in north India. Thousands of Jehar ceremonies were performed with street procession along with Bandbaja and close relatives. Temples were open throughout the night to perform midnight Pooja and to observe night vigil in honor of Lord Shiva. The fast would be broken on next day after sunrise. Many families would perform must do Khappar Pooja (खप्पर पूजा) before having the first meal of the day.